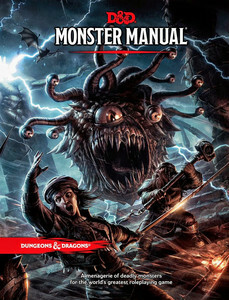 Over the weekend I acquired the Dungeons and Dragons 5th Edition Monster Manual... which I desperately needed for my conversion of "The Coming Dark, Chapter One" to 5th Edition. I have to say, even if you aren't a DM, I highly recommend you get your hands on it. It's a beautiful book and is chock full of lore and other tidbits of information on all your favorite monsters. You may not be analyzing each stat block in vivid detail, but you can enjoy it nonetheless. Needless to say, converting TCD has been... difficult. The campaign has existed in one way or another for four years and has had treatments in four different editions: 4E, Pathfinder, 13th Age and now 5E. In every edition before 5E it was pretty easy to put what I wanted into a given encounter; create your monster, and all the related math works itself out and balances everything for you. In 4E you can have a monster that's a mage with ten different types of spells, but since the damage from those spells is balanced and HP was predictable it wasn't a big deal. 5E is quite different, though: the players are fragile. At 1st level, it's actually pretty easy to kill a player, sometimes with a single blow. I find myself unable to create combats of the same scale as I did in 4E because the PCs aren't indomitable wrecking balls of destruction that just won't die. I have to scale things back, and sometimes that hurts. For example, at a pivotal point at the end of Act II the party encounters two mages. These mages are supposed to be powerful but still defeatable by a party working collectively and tactically. First off, let's assume I want to make a slightly difficult encounter for a 2nd level party... My XP budget would be about 750 XP. Two opponents gives a 1.5x multiplier, so that makes each opponent 250 XP. That means, assuming there's nothing else in the encounter, two CR 1 mages. But what does CR 1 mean? I'm hoping more explanation on how to calculate this magic number is provided in the Dungeon Master's Guide, but in the mean time it's a bit of a crap shoot to figure out. In Pathfinder it was sort of easy - the CR could be calculated from class levels - but it feels like CRs are all over the place in 5E. According to the NPC lists, a 4th level spellcaster is a CR 2... and that's the "cult fanatic", which isn't even worthy of being a named villain. If I make both mages a CR 2, the encounter difficulty would rocket up to 1,200 XP (400 XP each, 1.5x multiplier), which is far beyond the "deadly" 1,000 XP budget for a five man, 2nd level party. So, if I keep them at a CR 1, what level of a spellcaster is that? 2nd level? 3rd? That's hardly a menace... that's weaker than a "fanatic" for god's sake, and hardly worthy of a named villain. It feels like the math cheapens the encounter. Now I know what you're thinking... "the hell with XP budgets; put whatever you want." If I were the DM I could handle that, deal with the situation accordingly and manage the by-the-numbers impossible encounter so it's not as overwhelming as the math shows. But I'm not the DM here... I'm a publisher. Those numbers are there for a reason: to assist those fledgling DMs that don't know how to control the game. A seasoned DM would not have much a problem throwing a CR 5 at a 1st level party... He would know how to give the party a fighting chance and how to control the situation. You give that CR 5 to an inexperienced DM that only knows how to make attacks and roll dice, it'll be a slaughter. So as a publisher I have to respect them, whether I agree with them or not. And this scene isn't my only scene with such a problem. I hve a giant skeleton (CR 2) as literally the second encounter for a 1st level party. I have a scene with a pair of doppelgangers (CR 3s) against a 1st-2nd level party. I have a drow mage (CR 3, for now) summon a drider, which is a soul crushing CR 6 by MM standards, against a 2nd level party. I guess what I'm getting at is that things are way different and I must adapt. In 4E, all I had to do to "fix" the encounter is look at the numbers and scale things. You could just *make* a level 1 drider that's balanced! In 5E you have to look past the numbers, search for new creative ways to make an encounter much more meaningful, and much less deadly, than it would be if it were based on numbers alone. The party has help against the giant skeleton in the form of village guards. I've added the option that the giant skeleton, rather than target the party directly, might decide to go wail on some expendable NPCs instead. Even though the doppelgangers are working together, they're normally not in the same room. So they can deal with one at a time unless the party brings them together, but then it's their own damn problem. The drider is a "summoned drider", where I purposely reduced the stats to about a CR 3; it's still a threat given the other enemies in the encounter (and related multiplier) but not as overwhelming. And I added the possibility that the drider might be a little ticked at being summoned in the first place and take its rage out on the mage that made it appear, allowing the PCs to react accordingly. Still not sure what to make about my "two wizards" encounter... need to think about that some more. The Atomic Age RPG is, short of a better way of putting it, in "development hell" right now because of personal situations I find myself having to deal with (if you follow me on Twitter, you probably know). Eventually this will appear on Kickstarter. The Cavern of the Damned was in progress, but do to a drive failure I lost the map. It's about half done, and although it was intended for 13th Age I'm debating what system it will ultimately be for. The Coming Dark, Chapter One is about 90% complete, at least as a first draft. It's been rewritten for 5th Edition, so it's contingent on licensing options of course. I'm optimistic. This may or may not be on Kickstarter; don't know yet. Have one other pet project that I don't want to mention, but it could be really fun and I wish I had the time for it.